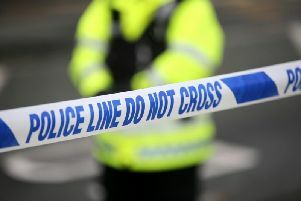 Police are appealing for witnesses following an armed robbery in Ballynure, Co Antrim on Boxing Day night. It was reported that at around 6.50pm on Tuesday, December 26, a man carrying a suspected firearm, entered commercial premises on Main Street in the village and demanded that staff give him money from the till and cigarettes. The man made off on foot in the direction of Carrickfergus Road, Ballynure with a quantity of cash and cigarettes. He is described as being approximately 5’ 11” tall, of slim build and was wearing a black coloured jacket, blue jeans and white coloured trainers. No one was injured during the robbery however police say staff members have been left shaken. Detective Constable Robinson is appealing for anyone who witnessed the incident or anyone with information which could assist with the investigation, to contact detectives in Antrim on 101 quoting reference number 885 of 26/12/17.